When you create homepage with Visual Composer, it’s a “static” homepage. Static homepage, other names “splash page” or “custom homepage”, is versus of “blog-like”, “non-static” or simple homepage. Static homepage helps you to create a sophisticated and eye-catching home which is totally different from default blog-like WordPress homepage. But you may prefer to use non-static homepage for your website. Here we talk about non-static or simple homepage activation and options in Publisher. Now select “Your Latest Posts” and save changes. It’s done. As described at top of the image, these options only applies to non-static homepage. 1- Homepage Layout: Select a homepage layout for non-static homepage. This overrides general homepage of website. 2- Homepage Posts Listing: Override default posts listing for this page. 3- Show Excerpt? Show/hide excerpt in listings with excerpt. 4- Categories: Show posts associated with certain categories in homepage. 5- Exclude Categories: Prevent posts of specific categories from showing in home page. 6- Tags: Show posts associated with certain tags in homepage. 7- Custom Post Type: You can show custom post types in home page. Add CPTs into this field. If you make changes to this field, don’t forget to add “post” to it if you need default post type still shows up. 8- Number of Posts to Show: Enter number of posts per page. Default is 10 posts. 9- Homepage Pagination: Select pagination of homepage. 10- Home Slider Type: Select homepage top posts block or a custom slider by “Slider Revolution”. If you select “Slider Revolution”, a new option appears right after this one to select one of sliders created by “Slider Revolution” plugin. 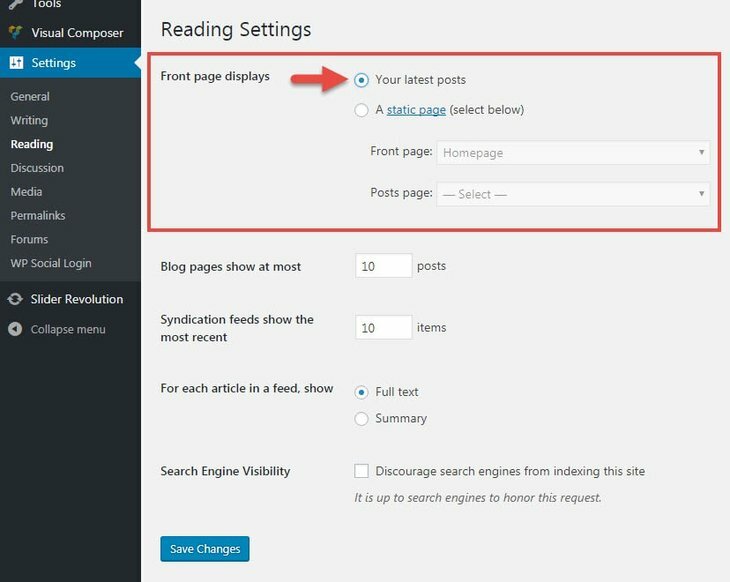 11- Home Slider Style: Select style of top posts in none-static homepage. “Slider” word is a little confusing here; if you select “Top Posts” for “Slider Type”, you will see top posts in a content block which you select here. If you select “Slider Revolution” for “Slider Type”, you will see post in a slider of “Slider Revolution” plugin. 12- Slider Overlay Gradient: Select slider overlay style. 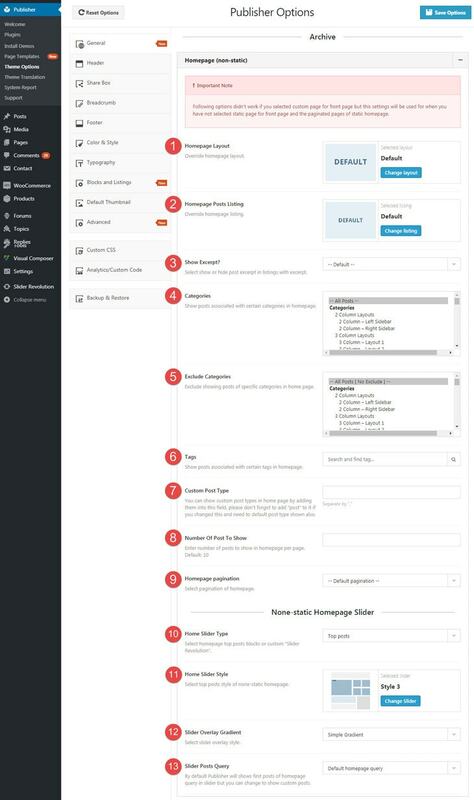 13- Slider Posts Query: By default Publisher shows first posts of homepage query in slider. You can change to show custom posts. If you select “Custom Query”, a new accordion appears with options just like options number 4, 5, 6 & 7 above. When you are using Better AMP plugin, AMP homepage has its own setting for showing static or non-static homepage. Read more about AMP homepage.